... .a ... o.. .
OS NTS~ cinO.sr. a os. ~e r .LflL A. 750 million, 687 million will be available for export and carry-over. the carry-over July 1, 1949 would approximate the prewar average. Wheat disappearance in 1947-48 was the third largest on record. prewar years and is about equal to U. S. domestic food consumption. making a total of 769 million bushels. crops presents a difficult transportation problem again this year. bushels in 1947 and an average of 1,588 million bushels in the prewar years. production last year, bilt still 20 percent less than the average for 1935-39.
the same as it was in 1947, but still below the prewar average. most of the drought area by rains in the first week of July. of such an amount would go to European countries participating in the ERP. a substitute for other foods which are short. 122; seed, 81; and exports and shipments 43.
very low levels on July 1, 1946 and 1947.
p -, 169 million bushels. rise in the general price level. b..ainag of the year were at record levels (table 6). to inly 600 thousand bushels. 111 Hillion Above Year Earlier '. 58 million on July 1, 1946, and 191 million on July 1, 1945.
ne'.7 record. Exports in 1945-46 totaled,394 million bushels, and in. 1946-47 they were 398 million bushels. Estimated exports to the various . shown in The ifmheat Situation, issue for LI:arch-April, 1948,' page 18.
that for the time being the Association of American Railroads has placed- . winter wheat arca. 'Wheat offered for sale is still permitted to move..
year, with earlier years for comparison, are shown in table 5.
farmers including interest and taxes. parity as of April 15. July 15. Farmers may use either or both the loan and purchase programs. program through September and flour export program well into September. and 6.3 million bushels of flour in terms of wheat. prices last fall when some winter wheat was seeded in dust, or seeded late. for winter wheat in the Great Plains and in European countries. were restricted by war and the carry-over reached all-time high levels. WHEAT. NO. 2 HARD WINTER: CASH PRICE, LOAN VALUE. premiums', they are not reflected in the ceiling shown in the chart. 'Includes shipments to U. S. Territories of about 4 million bushels annually. imal feed supplies totaled 136 million bushels. carry-over was increased slightly by a crop of only 741 million bushels. Sover remained below average but increased about 110 million bushels. that the 1948 season average price will be moderately above the loan level. was made July 15., This action was taken in view of the world food situation. the parity formula is changed and a new price support schedule is introduced. the August Outlook issue of The Tfheat Situation. cepted the Agruement were insufficient to insure its successful operation. which will lower quality but may not materially affect yields. lion bushels in 1947 and 287 million in prewar. In Italy production is . 27 million in prewar. The United Kingdom crop of 95 million bushels is over. in the southern regions and has begun also in the central and Volga regions. the middle of :ay through June as a result of persistent drought conditions.,. ever, with the exception of eastern and northern districts which received ..
estimated that about 5 million acres may not produce half a crop. WVoather has been generally favorable for the recently seeded crops in..
2/ Totl winter wheat acreage in Canada is less than a million acres..
contributing about 60 million bushels. would go to European countries participating in the European Recovery Program. .i::13 million tons of wheat and rye, or over 25 percent of their consumption. Ffor using food grains as a substitute for other foods which are short. Year: Weighted cash price of No. 2. Hard Winter Wheat at Kansas City I/ tLan0 . :Cents Cents Cents Cents Cents Cents Cents Cents Cents Cents Cents Cents Cent"
13 percent protein is included. 2 Loan rate is for wheat of less than 13 percent. Ceiling became effective January 4, 1944 at $1.62 including 1-1/2 cents commission,. 187.1. On June 30, 1946 ceilings expired. July: :Chicago :neapolis :Portland:Louis :growers :growers : . :Do-llares bolars DollarD r -Dolr-Ts Dollars Dollars Dollars Percent. 1948: 2.23 2.28 2.25 2.18 2.28 2.00 ---90 . Compiled from records of the Commodity Credit Corporation. 'bushel (average of 60 months from August 1909 to July 1914) by the Index of prices. a : : : :Total : disap-:ports: :Proc- : In-. : : : : : :ments: :food :al"
: Mil. Nil. M-I.-MIT. -MrT. "-Ri Mil. Mil. Mil. Mil. il. j'terly data 1902-44 in issue of :;.rch-April 1948, m-ae 2. 'Tblc 7.- Wheat: Weighted average'cash price, specified markets and dates 1947.
date : markets :Kansas City:Minncapolis:i:innLapolis: St. Louis: 2/ . June : 2.56 2.56 2.37 2.29 2.72 2.60 2.38 2.84 2.59 2.32 2.28 2.30. V1 Bcg'.nning July 9, 1947 sales of hard and dark hard winter combined. j Average of d._.il; cash quotations. avorages 1937-41 and 1942-46, and annual 1945-48 .
tors, and wnrhouses 37,797 65,401 42,129 8,376 10,116 29,683.
elevators ...........: 60,898 67,965 58,463 12,838 24,591 34,300:"
bins .............: -- 25.,366 23,700 7,351 500 2,530..
Commodity Credit Corporation in transit reported by CCC. Stocks in other-po. 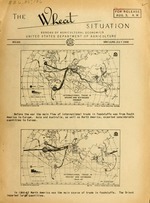 Annual 1941-44 in The Jheat Situation July 1947 page 9. 7 F.O.B. spot or to arrive. 2/ Fort 'Jillian quotation is in store. : .il. D.il. Nil. Mil. Nil. ;il. lil. hA:il. :'il. il. Mil. bu. bu. bu. bu. bu. bu. bu. bu. bu. bu. bu. of. IS?1 ie8aua Imemx-7 oes nour.j. s a u. J elimimey. ...... i Im m .